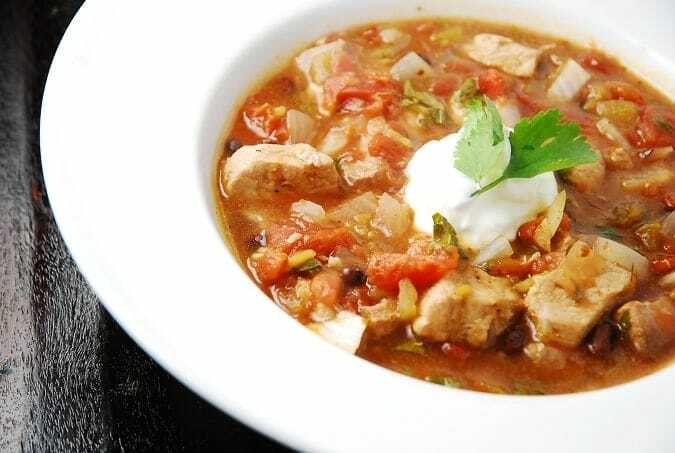 Normally, one wouldn’t imagine a bowl of steaming hot chili as a meal on a sweltering summer day, but this Crock Pot Pork Chili is so light and fresh tasting, it makes a wonderful Weight Watchers Summer Recipe. The pork is nice and lean, and the fresh lime juice really help give this low calorie chili a bright flavor boost and a summer-y feel. This is a perfect crock pot recipe for when you have a busy day ahead, as the prep work is minimal, so you can toss it all in your slow cooker and forget about it until dinner time. I also topped mine with some reduced fat sour cream and I really loved the flavor and texture that added to the chili. But feel free to top it with other flavor fixin’s you might like: jalapenos, green onions, diced onions, shredded cheese…these are all great options. This guilt free Crock Pot Pork Chili is an absolute winner. A fresh and flavorful pork chili recipe that’s light enough for a summer evening dinner. Full of spectacular tastes and aromas this hearty chili is incredibly healthy and satisfying and involves minimal preparation. Lay onions on the bottom of the crock pot. Add in cubed pork, followed by garlic, beans, tomatoes, green chiles, lime juice, and spices. Stir to combine. Cook on low for 6 hours. Stir in cilantro about 20 minutes before serving. hi. How many grams of sat fat and sugar are in this recipe? On the new smart points ww program that’s how the points are calculated now and I want to make sure I am getting the right new number of points. I put in a tablespoon’s worth. Once cooked, I will taste and adjust. I just realized I forgot to include the lime juice in the ingredient list. I must have deleted it when copying from my Word doc. Anyhow, the recipe calls for the juice from 1 lime. I have updated the post already. :) Thanks for catching this!! I have the same question as Gail… how much lime juice? I have it all cookin’ (without lime juice) in the crock pot right now and it smells delightful. This sounds great! Can’t wait to try it….and I was wondering about the lime juice too! I’m not a big citrus fan, but might try it in this recipe…thanks for a great post! Ah, that was my question as well. Can’t find the lime juice anywhere. How much lime juice? Looks yummy refreshing.